When that all-important “who are your competitors” slide comes up in the pitch deck, too many founders tend to reply with not-quite-coherent, or even outright not-believable answers. 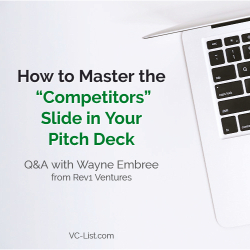 In order to examine this question, ‘who are your competitors?’ I recently interviewed Wayne Embree, an experienced seed-stage investor. 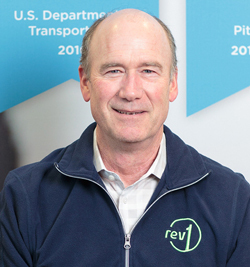 Based in Columbus, Ohio, Wayne has been involved in over 200 investments, including sitting on over 50 boards and taking more than 60 businesses through exits. Dave Hochman: Why do so many founders fall short when it comes to handling this question? Wayne: It starts with this idea so many founders start off with this premise that they actually don’t have any competitors. And then the general response to that is, “then you have no market. I think people are afraid of bringing up competitors from the perspective that it somehow diminishes their business….as opposed to giving it credit. They need to be thinking about, you know, competitors, as validating a market. Dave: What advice would you offer to a founder with a good idea but fails to recognize the importance of acknowledging the competitive landscape? “we don’t have any competitors.”, right? Wayne: Really go and really dive in and figure it out. Do the research and fully understand the marketplace, the competitors, and how they’re going to win. It’s also usually a good sign if a founder has researched the characteristics and capabilities of the chief executives and management teams from the competitors. Really go into the details of the companies in the competitive set. Dave: has there ever been a situation where “we don’t have any competitors” was an actual viable response, that actually belonged on a slide deck? Wayne: No. Because the marketplace you’re usually trying to serve has an existing way of dealing with a problem. Even the first person developing a wheel had competition, which was the sledge. Honestly, I cannot think of a single case where there wasn’t at least a status quo that represented competition. And the second biggest fail is discounting or even not considering the status quo. Dave: would you say that founders in recent years have been more or less competitor aware… any trends? What are you seeing out there when you see the slide? Wayne: Apologies for the sarcasm but we have this thing called the internet. And even though as most people know not everything on the internet is true, you could at least, you know, Google your industry that you’re in. We had people pitch us who didn’t even Google the name they picked for their company and didn’t know it was already taken. It’s an extreme example… but not too far off. 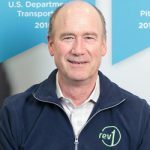 Dave: hard to imagine that a company seeking funding that would be able to get a meeting with a VC firm would come in that unprepared or unaware. Wayne: it happens more often than people think. And in some cases, they’ll go so far as to skip over their research on the venture firm, and so fail to learn that the venture firm they’re meeting with has actually funded their biggest competitor. The reality is that part of competitor analysis is ‘how well do you know your business, your market, your customers’ and so, if you spend any time at all with your prospective customers, which you should, they will tell who all your competitors are. Dave: what’s the worst ‘our competitors’ slide you’ve ever seen? Wayne: I think the worst was just a complete disregard for that. I mean, there was no slide. And when asked about the competitors, it was clear that the company had not even thought about that they might have competitors. They just weren’t interested in having that conversation. And so, yeah that would be the worst one, when there’s just no recognition of competition at all. Dave: So, some advice. What is one key element that founders should consider adding when they sit down to craft that slide? 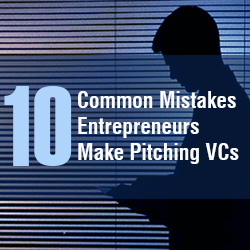 The importance of a good pitch can’t be overemphasized when it comes to winning capital for your startup. Venture capitalists offer more than money for your startup’s next stage of growth. 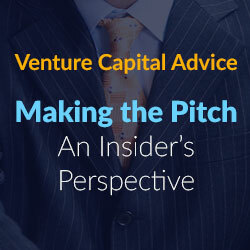 Angel investors have connections and invaluable experience to help steer your company to success, and impressing them with your pitch is crucial. 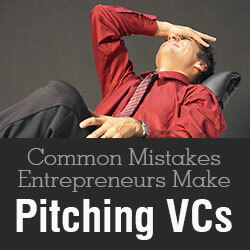 Crafting a perfect pitch is hard. An experienced investor has heard hundreds of pitches. There are some things they never want to hear again. 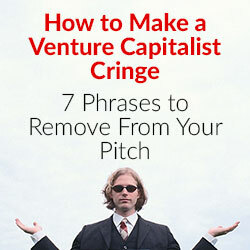 Here are eight phrases you should never say to a VC – and what to say instead. It’s great to pull in customers, but venture capitalists aren’t interested in philanthropy. They want to make money. What to say instead: outline very clearly how you’re going to make money. If you’re free to users, there better be some solid income streams that guarantee you’ll be able to stay afloat. Better yet, monetize. Unless relevant to the person you’re speaking with, name-dropping to impress smells as cheap as drugstore cologne. What to say instead: Explain why your team is qualified to succeed. Starting with your biggest accomplishments, detail your relevant experience, including education if that applies. Keep it succinct. Present evidence supporting your competence. Like most humans, investors are more impressed with intelligent humility than ego. Valuing a beta-stage project too highly can damage your credibility. In the VCs mind, the meeting is already over. What to say instead: value your company as realistically as possible. Consider an 18-month time range, which gives enough time to close funding, invest capital, and position the company for stable growth. Calculate how much you’ll need for salaries, overhead, marketing, and administration. Subtract that from your current monthly revenue – the smallest amount of money you can reasonably count on making. That’s roughly how much money you need to raise. Then step into the investor’s shoes and decide what percentage of your company that’s worth. Keep it logical. This entrepreneur’s attempt at appearing retrained might set off a few BS meters. VCs have heard it many times. What to say instead: if your numbers are projections, call them projections. If you are very confident in your projections, offer them, but try to avoid describing them as conservative. If your projections are based on actual sales, show how you arrived at your estimates. If your projection is pie in the sky – good luck. It’s pretty challenging to capture 1% of a large market and VCs know that, so show your potential investors how you intend to capture this often-invoked, rarely-seen market share. What to say instead: here is our strategy for capturing X sales/customers/revenues. How many customers do you have now? What does your cash flow look like? How will the VC’s investment contribute to that growth? You’ll sound awfully naive and ignorant of your business if you say you don’t have any competition. What to say instead: emphasize your customer’s pain point, how the competition doesn’t address that pain point, and how your company does. The projected Internal Rate of Return (IRR) is a number that VCs don’t want to hear. It’s a single number that brings together many unknowns that can change at any time. What to say instead: give projected sales, expenses, and investments; provide cash flows; arrive at an honest valuatio. Let the investor decide what she thinks the rate of return will be. What do VCs want to hear? Investors want to know what problem you will solve for your customers, how you’re going to make money, why you and your team are the best people to deliver the solution to the problem, and how you will return their investment. Investors are intelligent and dedicated. Show them you have these qualities, too. Be smart, humble and realistic. Most of all, try to be as transparent as possible. Gain their respect, and you’ll win their investments. You would have thought I had an advantage going into the fundraising pitch process. I was a venture capitalist early in my career and was involved in the investment process of 24 completed business-funding transactions. I have actively coached and mentored numerous entrepreneurs in strategy, business planning and corporate structure. My most recent entrepreneurial endeavor resulted in raising more than $5.5 million with a modest business plan at an extremely high valuation (we approached one VC firm and the deal was signed in a matter of weeks). My current business, NuVascular Technologies has a novel patented nanotechnology platform that is disruptive to our industry. Our first product’s addressable market is more than $1 billion. We assembled stellar scientific and business advisory boards and covered our backside with solid patent protection. We completed preclinical studies with amazing results and received a letter from the market leader that we were an acquisition target. We structured an extremely capital-efficient company with a modest first round funding requirement – but with ample opportunity to add investments at staged intervals to fuel exponential growth. We tried to structure a perfect VC deal but knew we were in that “in-between” place where the money we needed was too much for angels and not enough for most VCs who invest in our space. We decided to prepare two business plans: one tailored to angels and another to VCs with the main differential being that the angel raise was one-third the size of the VC raise amount, which equaled the first drawdown built into the VC raise. The response rate has been about 10 percent, even with personal introductions. This response rate includes any response, not necessarily an indication of interest. Don’t get too frustrated or feel as though VCs or angels you reach out to are unprofessional or don’t like your deal because they don’t get back to you. Most often, they have not gotten to your materials in the first place as they are inundated by dozens of other hungry entrepreneurs seeking the same attention you are. Or, they got it but it’s low on their priority list. They have their own fire storms to deal with. And a good portion of angels are still working full-time and investing is a part-time activity. I recommend staying diligent. By definition an entrepreneur has tenacity, so remain politely persistent until you get to a “yes” or a “no.” Don’t count on email alone. When in doubt, pick up a phone and call because most firms will tell you if their funds are fully committed or still being invested, their review process and timeline, and if they will contact you if interested or if you should keep checking in. Finding angels is not very difficult as there are ample lists available through basic internet searches. Their websites often describe their application process. Digging into who invested in companies in similar markets is a great way to find both VCs and angel investors. A company’s initial press releases, going back to when it was founded, often provide the names of the original investors and board members. You can then check other companies they invested in and see if anyone involved is in your circle of contacts to create a personal introduction. If you dig deep enough, you might find someone who belongs to the same church or whose kids are in the same soccer league as you or someone you know. If at all possible, try to time your fund-raising activities to coincide with that of the investing community and start your pitch process during the period from mid-January through April and then again after Labor Day until mid-October. As entrepreneurs we think since we are working seven days a week and holidays that everyone else should at least be working regular business hours. Yes, the investment community does work hard but there are blackout periods that makes it difficult, if not impossible, to raise funds. As a general rule of thumb, it is very difficult to raise venture capital from mid-July to Labor Day, and then again between Thanksgiving and mid-January. These blackouts are about the same for VCs as for angels. If you haven’t had your first partners’ meeting (VC) or screening committee meeting (angel group) well before these dates, there is a good chance you will lose all the momentum you built up getting there. Trying to get your VC or angel champion to get re-motivated and then for them to re-motivate their respective groups again is daunting. During the blackout period, deals are piling up that are just as interesting as yours but fresh to the investors. Here is an example of what can happen: I presented to a premier life science angel group’s 30-member screening committee. I was under the impression that if we passed muster we would present to the general group in a few weeks and hopefully generate enough interest to enter their due diligence process. We got great feedback from the screening committee and were told they would be happy to have us present to their full group in the fall after their summer break only 3½ months away. Why? Because they “squeezed us in” before they went on summer break. Ouch! When preparing to pitch our company, we took a long hard look at where all our key business indicators were and how much “investor risk” we had in the business. We spent years as an R&D house developing a novel nanotechnology and were transitioning to commercializing the technology, which represented a major shift in corporate culture. We proceeded to put together our due diligence binder and went through each section to determine our soft spots. The idea was not so much to receive a better valuation, but to make us more appealing as an investment bet. There is an awful lot of clutter and white noise in the pitch circuit, and you need to rise above it. Once we determined our week spots, we set out to take corrective action. For example, we are a medical device company and need FDA approval to market our products. So we initiated the process with the FDA about six months earlier than we would have if we had experience and a track record with them. This provided a running dialogue and a method to clarify what we lacked moving forward with regulatory approval. In this example, we focused on installing a Quality Management System to receive ISO (International Organization for Standardization) certification. This is no easy task and not necessary to raise funds, but we made the strategic decision to do so. Through these discussions, we also determined that we did not need as large of a clinical trial. This reduced our total raise amount by almost a third. This six-month process provided key data for our investors’ pitch and resulted in a more mature and prepared company. The lesson here is that it’s beneficial to put in the hard prep work prior to your core fundraising efforts – you don’t get a second chance to make a first impression. This is especially true with angel or VC investors. There is a constant flow of new deals for investors to look at and, quite frankly, if you don’t get their attention the first time around it’s rare that there will be a second. The investor community has its own grapevine, and word gets out fast on both good and bad companies. A few months into our pre-pitch period, we chose a few venues at which to present our company and its story. We picked two that were not necessarily in our investor target market to see how our presentation flowed, conveyed information and gauged audience attention. I have found that even if you are not presenting within their area of investment interest, people will pay attention if the story is compelling. If you lose their interest, you probably will lose the interest of your target audience as well. We made it a point to get feedback from people in the audience after each session. These sessions usually have a common area where people can mingle between sessions. Make ample use of this time. If you are shy – don’t be. Investors are looking for business leaders with moxie to lead the businesses they are betting on. Most are willing to provide feedback if approached politely. Don’t make the approach an appeal for funds as they will excuse themselves. The input we received using this approach was extremely insightful. Entrepreneurs have a tendency to get into too much technical detail and early on we also fell into this trap. The input we received made that clear. If you have samples of your product or written material you want to hand out, don’t do this before or during your pitch. You will lose the attention of most in attendance as they will be focused on what you handed out. Keep tight inventory controls in place. We have had medical device prototypes disappear or be mauled while being circulated in groups as small as 10 investors. We now offer a hands-on show-and-tell session after our pitch where we can answer questions about the device and more effectively describe its use. This also provides added opportunity for more in-depth conversation and the building of interest. When you do get the opportunity to pitch your company, your host or event organizer will provide you with any requirements such as the allotted time, Q&A format, PowerPoint policies and information about when and where handouts can be distributed. Not all venues allow PowerPoint presentations and follow what is affectionately called “Quaker Style.” Quaker Style is more of a testimonial than a presentation. In any case, bring back-ups of things such as laser pointers and handouts and bring electronic back-ups on your laptop or memory stick. Plan for what can go wrong, as it often does. Manage the rhythm and flow of your pitch and don’t be afraid to shut down questions. When you have five to 10 minutes to pitch, like it is with angel and public presentations, the last thing you want are questions from the audience. One question can eat up a third of your presentation time. Let them know that it is either included in your presentation or that because it’s “such a good question” you will address it at the end. Don’t fall into the trap of taking direction from the most vocal person in the audience, as they don’t typically speak for the group. Remain polite and in control. You have just a few minutes to convince them to want to know more. When speaking to smaller groups such as some VC or strategic partner meetings it may make sense to take questions. This can be to your advantage as the presentation turns into a discussion. When this happens, answer the question and test the waters by asking if that answered the question. Don’t be concerned if others join in. Keep the group’s pulse and manage the conversation so it does not get into to much detail or off subject. When it starts veering, bring it back on track. Feel free to be somewhat forceful, as most will appreciate you keeping the meeting on track. Get a sense of the level of interest in the room through body language. It can help guide you in terms of how much time to spend in each area as well as the appropriate level of detail. You may be presenting to a group who knows more about certain aspects of your business than you do – don’t waste their time. We presented recently to a potential strategic partner who controls 80 percent of one of our product’s market. We spent the majority of our presentation on our technical details and omitted business, market and financial data as they knew more about it than we did. This resulted in a lively discussion and the creativity was flowing regarding how our technology could be incorporated into their business model. The majority of your success when pitching comes down to the preparation you invest beforehand. Not only do you need to practice your pitch over and over while you’re driving, brushing your teeth and walking your dog, but you need to know who will be at your presentation, how knowledgeable they are about your space, what their views are and if they have had successful investments in businesses similar to your company. Spend time with your champion, invest time researching those that will be in attendance and, most importantly, have fun and let your passion shine. This is your time to brag and no one will or can do it better! There’s an old adage that when someone says it’s not about the money, it’s about the money. Venture capitalists live by this belief and pose a serious challenge when entrepreneurs come looking for funding. Wall Street icon Gordon Gekko believed that greed was good, but that was back in 1987. The investment world has changed dramatically since then. As you sell your entrepreneurial opportunity, guard against being perceived as greedy. Venture capital is not a lottery ticket, nor is it quick financial fix. It is a measured, albeit calculated, economic risk that venture capitalists are willing to take. If you come off as wanting too much of the pie, you will get none. Never appear desperate to venture capitalists, and remember that there are many more where they came from. Both sides have priorities and needs, and there must be a correct fit between the two. If the chemistry isn’t there, it’s best to move on as it will assuredly cause problems in the future. Think of your presentation as a round of speed dating: if it doesn’t feel right or look right, then it isn’t right for you. Keep your options open, as the future is highly unpredictable. When looking for capital, think about today, as well as tomorrow, and maintain a flexible idea for your possible exit strategy down the road. There may come a time when you decide to take some money off the table. Leave nothing to chance or fate by doing your number crunching before, rather than after, the fact. Thoughtful preparedness now may pay significant dividends later, literally and figuratively. Don’t be put off by an initial negative response. A “no” today may not be indicative of future considerations, and venture capitalists might see your start-up in a different light at a different time. There are a multitude of factors involved with securing seed money — from financial market conditions to entrepreneurial ebb and flow to political turmoil. These often varying and sometimes intangible factors can affect venture capitalists’ decisions, pro or con. Even faced with a thumbs down, you must remain confident with your idea, and look to refine it as necessary. Remember, have a game plan for evaluating your venture capitalists as they do for you. Know what to say before they ask, and know what not to say if they ask. Above all, believe in yourself and your entrepreneurial opportunity. Whether the venture capitalists’ answer is yea or nay, you can stand tall and look toward the future. Once you are able to receive funding from your first investor, launch your new business into a startup success story armed with this collection of entrepreneur resources. Watching entrepreneurs pitch venture capitalists, after a while, you tend to notice some consistent behavior patterns. Here are ten common mistakes that you might want to avoid, and tips for how to increase your chances of a successful meeting. Tip: Prior to your pitch meeting, be very clear about what VCs do in general – make equity investments in startups – and what they’re looking for – equity returns through liquidity events (IPO or sale of the company) within 2-5 years. They don’t lend money that you can pay back with interest; so once you’ve raised VC financing, you are on a path to be sold. Tip: Do some research on the firm prior to your meeting; most VC websites are excellent and clear about explaining what they do and where they invest. Make sure you’re targeting VCs who invest in your geography, your industry, your stage of growth and your size of deal. And make sure they’ve got investable funds. Tip: If your project still requires years of university lab research, you’re too early for VCs – they don’t like to invest in science projects. And if it’s just your shining faces and a pitch deck, you’re too early for VCs – they expect to see a product and, ideally, customer traction. Tip: VCs will be scared away if you come across as uncoachable, inflexible, unwilling to share control and unwilling to consider bringing in new executives at the right time. They can be great to work with when they find a great idea, led by a team that’s coachable and puts the company first. Tip: How much customer discovery have you engaged in? Do you have a first-hand understanding of their pain (their unmet need)? How are they addressing that need today, however poorly? Have you developed a sense, through customer interaction, that they would switch to your solution were it to become available? Can you document input from customers? Better yet, can you show customer traction (read: actual sales)? Tip: Don’t get caught claiming, “We don’t have any competition,” because it belies a real lack of business and market savvy. Granted, your solution may be better/faster/cheaper/cooler than the customers’ current way to doing things, but make no mistake: all new market entries – even truly disruptive innovations – have competition, and it’s the way things were being done before they showed up. Tip: Is the customer problem you’re addressing an urgent issue (a shark bite) or a minor issue (a mosquito bite)? VCs invest in startups that solve shark bite issues. Tip: Do you have a clear plan for how your business is going to generate revenue? Too many entrepreneurs, particularly in the Internet and mobile spaces, when asked how they plan to make money, respond, “By selling to Facebook or Google.” That’s not a business model, it’s an exit strategy – and probably an unrealistic one if you don’t have a realistic revenue-generating approach in the first place. Tip: “If we build it, they will come” screams naivety, as does, “If we capture only one percent of the market, we’ll still be successful…” VCs want a grounded go-to-market plan, including a clear operational roadmap detailing headcount, geography, product introductions and promotional tactics. If you adhere to the 4Ps (product, price, place, promotion) with your marketing execution, you can’t go too far wrong. Tip: Are your revenue forecasts realistic? Use logic checks such as: Are year four and five sales a reasonable share of the total addressable market? Are you accounting for competition? Do you allow for sufficient lead-time to launch the product and the marketing campaign, and to reflect reasonable sales cycles? Are your profit projections realistic? Use comparable companies’ financial ratios as a reality-check – for instance, expenses for R&D, marketing, sales, etc. as a percentage of revenue; and gross profit and operating profit and a percentage of revenue. Finally, remember that as VCs listen to your pitch, they’re not looking for some magical “right answer” (for there is none), but rather the thought process by which you arrived at your plan, and to engage you in a conversation. VCs tend to be thoughtful, flexible, logical, evidence-driven and fast on their feet. They like investing in teams with the same traits – along with passion and strong execution bones. So come prepared, then relax and let the intellectual sparks fly.